Some mornings can become a strong memory. I woke up exceptionally early from a weird dream and couldn’t sleep anymore. The sun was just coming up and through my window I looked up to a crisp clear blue sky. It was like I took a flight to a place far away, with a completely different climate. It had been a while since I’ve seen this, I’d gotten used to the dark skies of the rain season. I walked up to the rooftop. A few blocks further I saw the white iconic church towers on Plaza de Armes. All the colonial buildings are made of white stone, called sillar, which comes from the local mountains. Behind that the two volcanoes, Misti and Chanani, It made me happy, witnessing the sunrise on my own while everyone else was still asleep. 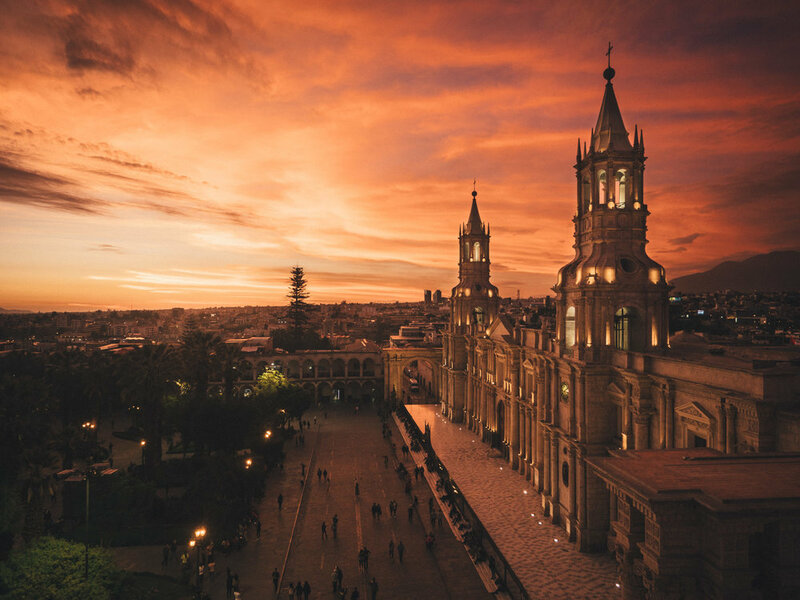 Arequipa is situated in the desert part of Peru in between the lower costal area and the altiplano. At an altitude of 2300m, It has a very pleasant climate year around, with a short rain season in January and February. Currently days are sunny with a bit of rain in the afternoon. Nothing compared to the downpour I experienced days ago in the Andes. Just before I arrived in Arequipa I got a job request from a client in NYC. This couldn’t be timed better, because I wanted to wait out the rain season here before I would continue cycling. Pascal, a Canadian cyclist, whom I met some weeks ago was here also taking a long break. And the frenchies Sophie and Jeremy, who are cycling from Alaska, also took days off. 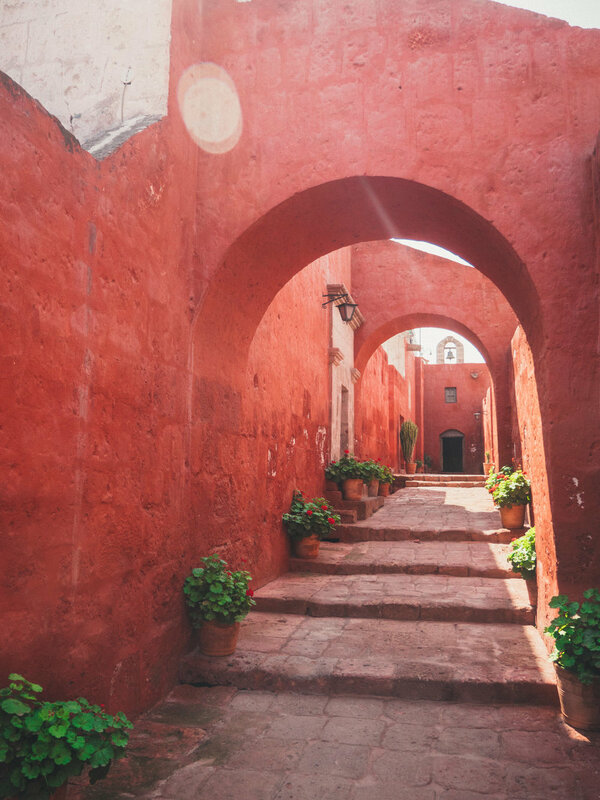 Arequipa is the perfect place to wind down. Despite being the second largest city in Peru, the old centre feels quaint and compact. It has the character of a small colonial town, with many trendy informal eateries, coffee places and some craft breweries. Cecilia is here too, on her one-month trip around Peru. We hang out on the Plaza de Armes watching the pigeons. Peruvian women sell queso helado in the streets, a local artisinal ice cream. During the days I’m mostly busy doing work in an old fashioned, budget hotel. The pillows are hard, but my room has a table with chair and the wifi is reliable, something which seems hard to find here. Every morning a vintage radio in the small courtyard plays huayno, traditional Peruvian folk music. The male house cleaner sings along with the songs that all sound the same. It’s a dated place but authentic hotel, which has its charms. For lunch we often go to one of the restaurants that serve ‘Menu del dia’, sometimes three rounds for nothing more than 10 soles (€3,20). In the evenings we would join up in Chelawasi Brewery, or Burger Chules which has a clumsy complicated menu and tacky music videos, but the burgers are great and the staff extremely fast and friendly. I joined the Masa Critica (critical mass), a friendly protest bike ride through the city. It’s organised every month by a couple who own a bike shop, to raise awareness for cyclists in the city. Pascal and the frenchies were there too. 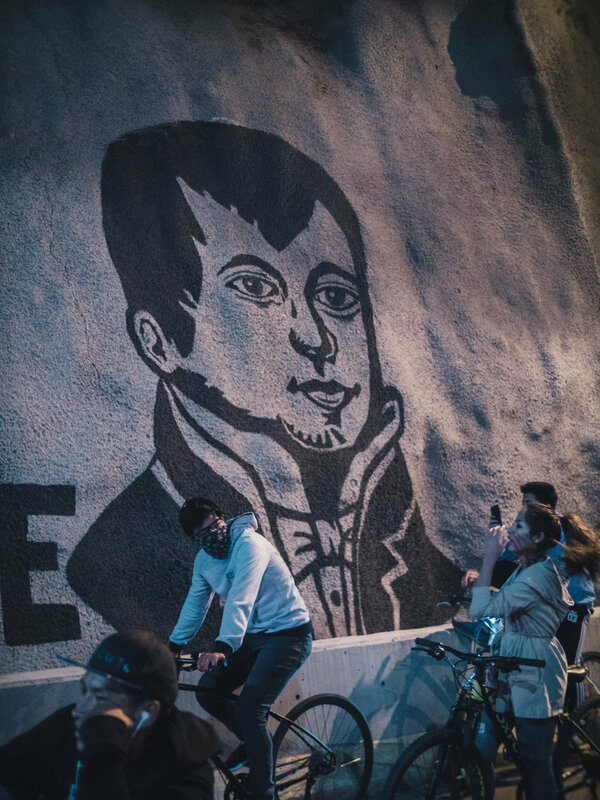 About 200 people joined the ride, young and old on all kind of bikes, dressed up with colourful lights and loud music through bluetooth speakers. It brought a smile on the faces of spectators. There’s only good vibes coming from a large group of cyclists. Arequipe is a place that easily grows on you. I spend my days working, writing and spending time with new made friends and other travellers. The sun grew stronger every day and the clouds vanished. Work got finished, people moved on, and so needed I.